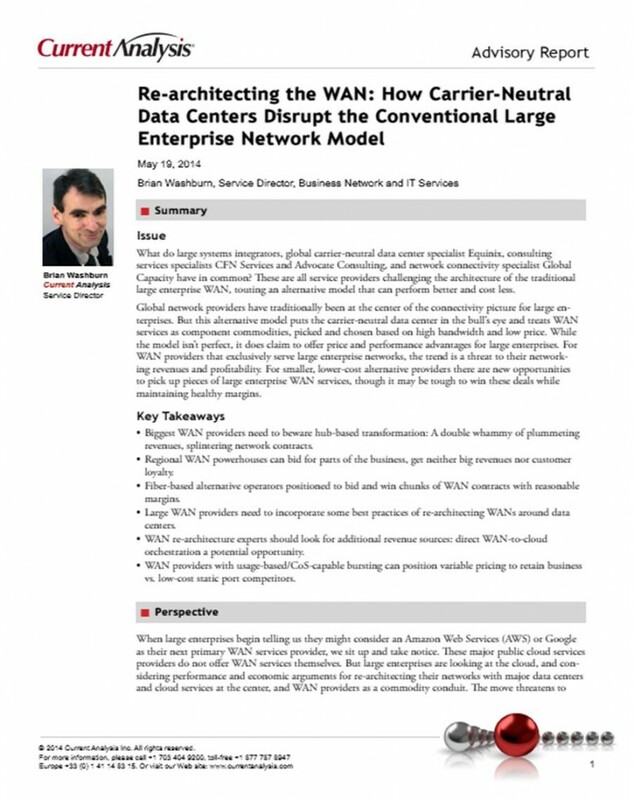 Current Analysis examines the enterprise move toward hub-based network re-architecture around major global data centers - challenging the traditional architecture of the large enterprise WAN with a model that could perform better and costs less. Increasingly, organizations are moving their business-critical IT infrastructure and applications to external data centers and cloud service providers to address the proliferation of data growth. This mass migration to the cloud is shaking up the stronghold that global network providers once had on the enterprise market. In this report, learn about an alternate approach where companies restructure their wide area networks around carrier-neutral data centers to improve the performance of business-critical and latency-sensitive applications, simplify cloud deployment, and reduce overall networking costs. This new model puts neutral data centers in the bull's eye allowing enterprises to select WAN services based on high bandwidth and low cost.